NASHVILLE, Tenn. — Most Americans want more religious meaning to the Christmas season, and for some that includes the seasonal greetings we say to each other. Those looking for more Christ in Christmas in 2018 are significantly fewer than four years ago, however. A 2014 LifeWay Research study found 79 percent of Americans at that time said Christmas should be more about Jesus. 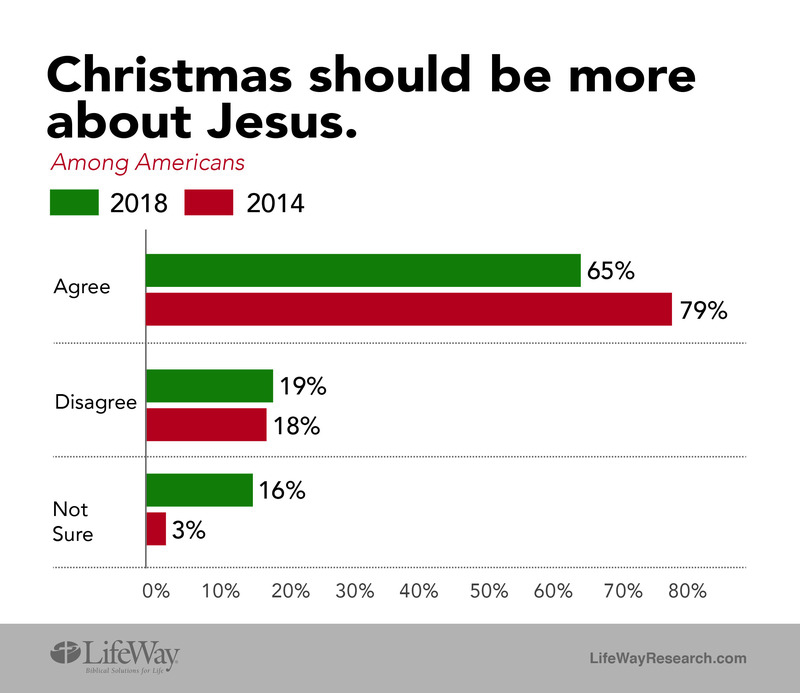 While similar numbers disagreed in 2014 and 2018 (18 and 19 percent respectively), the percentage who said they were unsure if Christmas should be more about Jesus jumped from 3 percent four years ago to 16 percent today. Much of the shift came from non-Christians. In 2014, a majority of members of other faiths (63 percent) and almost half of the non-religious (46 percent) agreed that Christmas should be more about Jesus. Today, those numbers have been cut in half. Americans 50 and over are almost twice as likely to say they find “Happy holidays” offensive than those under 50—42 percent to 22 percent. “It’s likely that Christians and older Americans are nostalgic for previous years or reluctant to acknowledge that not everyone celebrates Christmas this time of year,” said McConnell. Frequent religious service attenders are more likely to be offended by “Happy holidays.” Almost half of those who attend a worship service once a week or more (47 percent) say the substitute greeting is offensive, compared to 35 percent who attend once or twice a month, 32 percent of those who attend a few times a year, 23 percent of those who attend once a year or less, and 21 percent of those who say they never attend. LifeWay Research conducted the study of 1,004 Americans, Sept. 21-23, 2018. The survey was conducted using the web-enabled KnowledgePanel®, a probability-based panel designed to be representative of the U.S. population. Initially, participants are chosen scientifically by a random selection of telephone numbers and residential addresses. Persons in selected households are then invited by telephone or by mail to participate in the web-enabled KnowledgePanel®. For those who agree to participate, but do not already have internet access, Ipsos (formerly GfK) provides at no cost a laptop and ISP connection. Sample stratification and base weights were used for gender, age, race/ethnicity, region, metro/non-metro, home ownership, education and income to reflect the most recent U.S. Census data. Study-specific weights included for gender by age, race/ethnicity, region and education to reflect GSS 2016 data. The sample provides 95 percent confidence that the sampling error does not exceed plus or minus 3 percentage points. Margins of error are higher in sub-groups.